OLIVER CROMWELL died in 1658 after an attack of “malaria” followed by a bout with a kidney infection. But his enemies didn’t consider such a death good enough for the man who led England through its period of Puritan dominance. Two years after Cromwell’s death, Parliament restored Charles II to the throne, and royalists exhumed Cromwell’s body from Westminster Abbey, hanged it, cut off its head and put it on a pole at Westminster Hall. 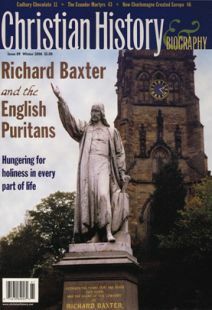 Richard Baxter later reflected, “Never man was higher extolled, and never man was baselier reported and vilified than he.” Cromwell’s fighting men adored him, and Puritan giants like John Owen and John Milton backed him. Yet history largely reviles him. Foreign leaders feared and admired him. But the English public loathed many of the reforms he endorsed. He deposed a king and dabbled with republican ideas far ahead of their time. Still, he ruled with an iron fist and gained infamy for ruthlessly butchering Irish rebels. The great Puritan leader embodies the contradictions of these remarkable years. Cromwell was born in 1599, four years before Queen Elizabeth died. His family, like most Puritans, wholeheartedly supported the queen as she projected English power against the hated Spanish Catholics. The queen, however, did not support the Puritans’ relentless efforts to finish the Reformation, purge the church of incompetent clergy, and remove high-church elements from the Book of Common Prayer. James I, who succeeded Elizabeth in 1603, clashed with the Puritans—who composed an influential minority in Parliament—over his foreign policy, especially his failure to give enough aid to Protestants fighting the Thirty Years War on the continent. He also thumbed his nose at the Puritans’ observance of the Sabbath by publishing the Book of Sports, which allowed games on Sunday after church. Yet no ruler attracted Puritan ire like James’s son Charles I. Charles married a Catholic in 1625 and enjoyed Anglican ceremonialism. Parliament and the ambitious, unyielding new king immediately jousted for power. Charles led Britain into costly wars in mainland Europe and later an ill-fated campaign against the Scots after they rebelled against his efforts to impose the Book of Common Prayer. Parliament retaliated against Charles by refusing to fund his wars. Charles tried to avoid the problem by not calling a Parliament from 1629 to 1640. The king picked a fight with the Puritans in particular when he appointed William Laud archbishop of Canterbury in 1633. The notorious Laud imposed Catholic forms of worship, advocated Arminian theology, and forced Puritan ministers to read the Book of Sports from their pulpits. His ruthless suppression of opponents—three protesters had their ears cut off in 1637—prompted many Puritans to leave England for the Netherlands or America. When Parliament returned in 1640, they tried to ban bishops, whom they saw as agents of the king. Charles stood by his father James’s dictum: “No bishops, no king.” He fervently guarded the “divine right of kings” to rule with absolute authority. But republican sentiment was spreading, and Charles could only resist Parliament for so long. He reluctantly allowed them to imprison Laud, whom they eventually executed. When Charles launched one final scheme to suppress Parliament by attempting to seize its leaders in 1641, they sniffed out the plot and escaped. Both sides readied for war. During the war’s first year, Parliament’s armies dominated London and most other major English cities. Their navy cut off Charles from his allies on the continent. To offset his opponents’ advantages, Charles negotiated with the Scots and offered to limit his monarchy and impose their Presbyterian state church on England. But the Scots chose to ally with their Calvinist kin in Parliament. Still, the war did not turn decisively for Parliament until late 1644. Earlier that year, Oliver Cromwell, who had been elected to Parliament in 1628, led a dramatic victory at Marston Moor. Blinded momentarily by the flash of a pistol whose bullet grazed him, Cromwell led his men to the opposite flank where they destroyed a detachment of Charles’s Royalist cavalry. Then he led his men toward the center of the Royalist line and wiped out the infantry. Much to Cromwell’s dismay, his leaders did not press the victory. Convinced that political appointees in the military were hampering the war effort, Cromwell advocated the self-Denying Ordinance, which banned members of Parliament—including himself—from leading the army. Cromwell enjoyed entertaining guests with French wine. He loved roast beef and ale, liked singing, and appreciated organ music. He also battled a nasty temper. He deliberated long and hard before making decisions, but once he committed himself, an unshakeable faith in providence cemented his judgment. This unity and mercy did not extend to Charles I. After that decisive battle, the defeated king escaped siege at Oxford and surrendered in June 1646 to the Scots, from whom he hoped for better treatment. By the end of 1647, Charles convinced the Scottish Presbyterians to accept his previous offer of compromise. Theological kinship gave way to pitched battle as Cromwell moved swiftly to divide the English Royalists from their new allies in the north and captured Charles. Until this point Cromwell had not decided against monarchy. He believed the country needed decisive, centralized leadership that could enforce religious freedom and other reforms. But Cromwell and Parliament had had enough of Charles’s scheming. The king would have to die if they were to rule. Cromwell called Charles “the hardest-hearted man that lives upon the earth.” Just as God had rained judgment on hard-hearted pharaoh in order to free his people, Cromwell believed, he would do the same to Charles. Charles’s son solicited Irish help so that he could regain the throne. This only stoked English hatred for the Irish. Eight years earlier, Irish Catholics had massacred between 40,000 and 50,000 English Protestant settlers in Ulster. Many in England interpreted Charles I’s slow response as license. Cromwell beat Charles II to Ireland and led an expedition to suppress the Catholics between the summer of 1649 and the spring of 1650. After his army defeated the Irish detachment at Drogheda, Cromwell ordered his soldiers to kill all the remaining men who could bear arms. Cromwell believed that he was justified in slaughtering “these barbarous wretches” because it was “a righteous judgment of God” and “it will tend to prevent the effusion of blood for the future.” But this massacre of nearly 3,500 remains the biggest black mark on his legacy. It was not long before Cromwell had defeated the Scottish threat as well and subdued the entire British Isles. These stunning successes gradually led him to believe that God had appointed him for a mighty task. The Puritan ideal for Britain was rooted in the theocratic mission of ancient Israel, and Drogheda seemed to resemble some of Joshua and David’s greatest victories. As the Puritan Moses, Cromwell assumed de facto leadership of Britain. For the first-and last-time in English history, the Puritans, though still in the minority, found themselves in a position of cultural power. During the Civil War, Parliament had called 121 Puritan clergymen together to reform Laud’s Church of England. The resulting Westminster Confession of Faith conformed church teaching to the Calvinistic theology dominant among English Puritans and Scottish Presbyterians. Other reforms followed. The tolerant conditions of the new “Commonwealth” allowed nonconformist groups to grow as never before, and Puritans like John Owen held influential public positions. Church leaders nominated a “Parliament of the Saints,” which introduced civil marriage, registered births, deaths and wills, provided care for the mentally ill, and heard and answered prisoner complaints. They ended the enforced tithes and even tried, albeit without success, to restrict the death penalty to treason, rebellion, and murder. Cromwell believed that his government’s most significant accomplishment was the broadly orthodox Protestant state church, which functioned like a Congregationalist oversight body. Some dissenting churches could meet, and local congregations made most decisions. Committees worked to fill Britain’s pulpits and schools with quality pastors. But the Puritan movement was a wide-ranging political and theological coalition, and not every Puritan trusted Cromwell. To Richard Baxter, the religious diversity of Cromwell’s New Model Army looked more like anarchy. He had backed the fight against Charles only to limit the monarchy, not to kill the monarch. Internal factions—such as the growing divide between the radical republicans and moderate monarchists like Baxter, as well as continuing conflicts over the proper form of church government—hampered Cromwell’s leadership. Cromwell pushed for compromise and stability, but that did not suit his temperament. He called a number of Parliaments, but he could not tolerate their inefficiency. For the rest of his life, Cromwell trusted fewer and fewer men to share the nation’s leadership. Eventually he trusted only himself. Worried that his reforms would not endure, he even considered taking the crown in 1654 and again in 1657—permanently alienating staunch republicans like John Owen. Ideological consistency never captivated Cromwell. He fought against monarchy but he had no problem with dictatorship. He simply wanted modest religious tolerance and fair treatment for his military, and he didn’t worry about how he accomplished those goals. Cromwell settled for the title of Lord Protector and operated much like a king. He taxed Royalists to fund Major Generals, who governed 10 different regions of Britain and guarded against uprising. They also enforced bans on blasphemy, swearing, some dancing, and that Catholic holiday—Christmas. Their intrusive control eventually turned public sentiment against Puritan rule. Cromwell’s son Richard assumed the title of Lord Protector, but unlike his father, he led no stunning attacks, nor did he share his father’s religious devotion. The Protectorate fell apart quickly. Richard lost control of Parliament, and Charles II sweet—talked his way back into Parliament’s good graces. The Puritans never reclaimed their lost power and endured persecution for many decades.